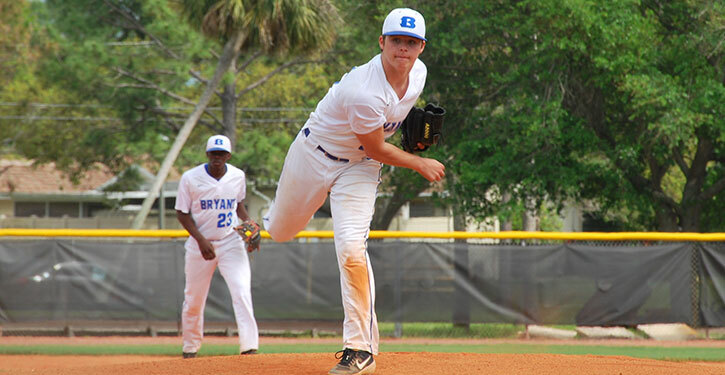 After having two previously scheduled 6A-South Conference games rained out, the Bryant Hornets finally got league action in on Tuesday, earning a 12-3 victory over the Little Rock Central Tigers at Bryant High School Field. It was like they brought good weather back with them from Florida where they went 6-0 during a spring break trip. Tuesday’s victory improved the Hornets’ overall record to 15-2 going into a Friday doubleheader in league play at Fort Smith Southside. Not only did the Hornets bring back good weather, they returned with the offensive momentum that has produced six wins with scoring in double figures this season, including five of their last seven. Senior Logan Chambers went 3 for 3 with three runs scored and three driven in to spur the offense. Austin Ledbetter helped himself with three RBIs, Jake Wright drove in three and Coby Greiner had three as well. Greiner, Logan Catton and Jake Wright each had two hits. Ledbetter picked up his fourth victory on the mound but surrendered his first runs of the season in his fifth outing of the campaign. Greiner relieved in the sixth and retired all six batters he faced. “Austin’s been more efficient in previous games,” said Hornets head coach Travis Queck of his starter, who threw 80 pitches in 5-plus innings. “I saw him laboring toward the fifth and that kind of concerned me, so I got some arms up ready to go. Once he got in the sixth and walked the first guy, I went to Coby. I have all the confidence in the world in Coby. 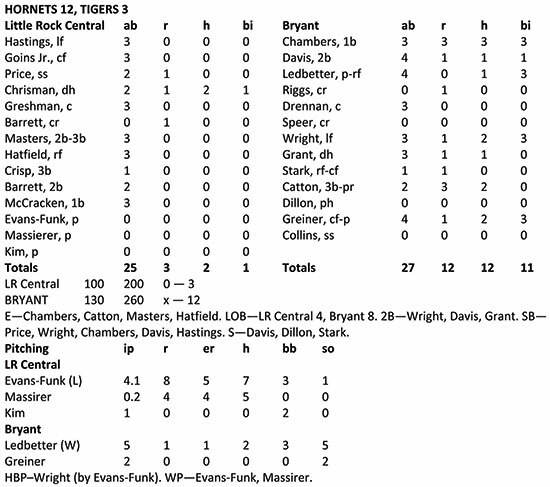 The Tigers broke Ledbetter’s 18-inning scoreless streak in the first frame. After the first two were retired, C.J. Price drew a walk. He stole second then scored when Paden Chrisman pulled a single to right on a 1-2 pitch. Ledbetter had been a strike away from getting out of the inning. But he bounced back and eight in a row after that with help on stellar catches in the outfield by Gage Stark in right and Wright in left during the third. Stark’s was a shoestring grab of a looping liner and Wright’s was a diving stab of a liner. By then the Hornets had tied the game in the first and taken the lead in the second. Chambers led off the home half of the opening frame with a solid single to center. Noah Davis sacrificed him to second and a wild pitch allowed him to reach third. Chambers scored on Ledbetter’s groundout to short as the Tigers gladly traded the run for an out. In the second, Wright was plunked by a pitch from the Tigers’ starter, Jacob Evans-Funk. An out later, Stark drew a free pass. Logan Catton loaded the bases with an infield hit then Greiner came through on the very next delivery with a sharp single to center that plated two. With runners at first and third, Chambers got a squeeze bunt down and beat it out for a single as Catton scored to make it 4-0. With one down in the top of the fourth, Chrisman, who had the only two hits Central got, singled up the middle. Mason Greshman grounded to the right side, but an errant throw had two aboard. 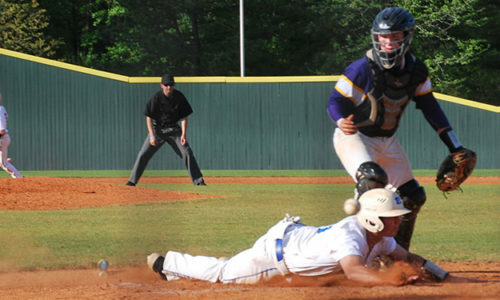 The runners moved to second and third when Nikko Masters tapped out and, with Hatfield at the plate, Ledbetter came within a strike of ending the inning right there. He induced a slow roller to third that Catton charged and fielded. But his throw to first was in the dirt and got past Chambers. Chrisman and courtesy runner Ty Barrett scored, and it was 4-3. In the bottom of the fourth, Catton beat out an infield hit up the middle and, an out later, Chambers drew a walk. When Davis’ grounder to second was kicked around, Catton hustled home from second. Chambers and Davis worked a double steal which helped produce another tally. Ledbetter picked up the RBI with another groundout. “I’m proud of the guys for bouncing back after that rough inning,” said Queck. Ledbetter worked through a scoreless fifth despite a walk to Asher Hastings with one out. Wright raced deep to haul in a fly off the back of Javii Goins Jr. The Hornets blew the game up in the bottom of the fifth. Logan Grant led off with a double down the left-field line. Stark sacrificed him to third then pinch-hitter Peyton Dillon was hit by a pitch. Evans-Funk gave way on the mound for the Tigers as lefty Joe Massirer entered the game. But Massirer received a rude welcome. Greiner singled in a run, Chambers singled in two then scored on a long double to left by Davis. Ledbetter followed with an RBI hit to right that was misplayed, allowing him to reach second. He took third on Cade Drennan’s grounder to the right side then scored on Wright’s single, making it 12-3. Ledbetter walked Chrisman to start the sixth and Greiner relieved. He retired three in a row but, the third one to end the inning, required stellar plays at third by Catton and at first by Chambers. Looking to make it a run-rule game in the bottom of the sixth, hoping to save an inning of work for Greiner, the Hornets produced a threat. Stark walked and was sacrificed to second by Catton. Greiner grounded out as Stark moved up a base. And, after Chambers was walked intentionally, Jae Kim, the third Central pitcher got out of the jam as Davis flew ouit to center. Greiner fanned two in a 1-2-3 top of the seventh to close out the win. “That was the best team effort I think we’ve had all year,” Queck declared. “I thought, 1-through-9, they did what they were supposed to do in their situations. “You know, there were a couple of situations we could go back and change, like the sixth inning,” he related. “Gage stole third and I wish I’d have just given Logan a take right there. That way we have two chances to score him and end it in the sixth.